Madam Miaow Says: What's Donald Trump's trade war with China REALLY about? What's Donald Trump's trade war with China REALLY about? So the west is at it again, carving up the juicy market of 1.4 billion (EDIT 1.386bn in 2017) human beings that is China. I suspect most people have twigged by now that US President Donald Trump's trade war on the upcoming nation has little to do with the purported goods deficit of over $300bn. As Gary Cohn, former Goldman Sachs supremo and Trump's ousted top economic advisor (replaced by Fox News commentator Larry Kudlow), pointed out at the recent Bloomberg conference in Singapore, the sum does not, as claimed by Trump, represent a loss of money. It actually means over $300bn of goods that Americans were able to buy cheaply, as if you'd spent at Walmart or T K Maxx, or if you'd bought groceries from the supermarket. Having consumed the goods they sold you, you wouldn't then demand your money back with menaces. Presumably. I’d been hoping for the press to fact-check the issue of Trump’s trade war on China, which threatens to tip parts of the world (including America) into recession. I am disappointed to see the figures of $376bn and $500bn US trade deficit with China regurgitated in the British and American media with few corrections, or any attempts to cut through the hawks’ spin. The figures of a $376bn and $500bn trade deficit for the US excludes in-country sales and services in China by enormously lucrative US companies such as Apple, Starbucks, Coca Cola and McDonalds, which generate vast profits out east. When that’s taken into account, the actual trade balance is more like a $24bn surplus for the US, but this fact doesn't serve the narrative and therefore gets left out, thanks to laziness or connivance in the press. These elevated figures are further distorted by the fact that China is still mainly a base for assembly of goods which the nation is hoping to leave far behind in favour of high-end tech. So, for example, a thousand-buck iPhone X costs around $500 to make, out of which the high-end components are made elsewhere (Taiwan and South Korea), while China's costs amount to about 10 per cent, or around $47. And yet the entire wholesale cost of $500 is counted in the purported deficit with China — a ten-fold distortion. The richer country should always have the surplus, as they can afford to buy the goods in the first place. Americans do not save. Chinese do. Trump’s tax cuts have pushed their overall deficit to well over a trillion and rising. This will bite them on the bum, but we can guess who’ll be blamed. Far from manipulating the yuan down, which even smart critics such as John Oliver repeat ad infinitum, China used large amounts of its reserves propping it up. Under Trump’s attacks, the yuan is buckling and if China does what the US wants they could easily burn through all of their cash. There’s both irony and cynicism in the fact that the very measures that Trump is taking will, according to HSBC and others, weaken the yuan against the dollar. Not to mention that the dollar is powering up against a whole basket of currencies, not just China. However, Trump likes to have his beautiful chocolate cake and eat it ... greedy boy! He was disappointed to be told on entry to the White House that, no, he wasn't allowed to print money; manipulation of the currency not being a point of principle for our orange overlord, just a means to an advantage. Besides, what does Trump think Quantitive Easing is if not wholesale manipulation which saved America and others from the 2008 financial meltdown? China has raised about 800 million of its people out of poverty by making our stuff in cruel, unhealthy conditions in suicide factories such as the Taiwan-owned Foxconn, for low wages. This has facilitated higher living standards for western consumers, and huge profits for American companies. During the bankers’ crash of 2008, China picked up the debt slack and allowed Americans to live beyond their means. Now that western capitalism is in decline and facing crisis, China is being politically scapegoated. This is not only unfair on a nation only recently getting up off its knees after nearly two centuries of western abuses, it also muddies the waters so the global economy can’t advance. The IMF's Christine Lagarde noted earlier this year that the global economy was in sync, floating itself out of the economic devastation of the 2008 crash together. After Trump's trade tariffs, not so much. There’s plenty for China to negotiate. 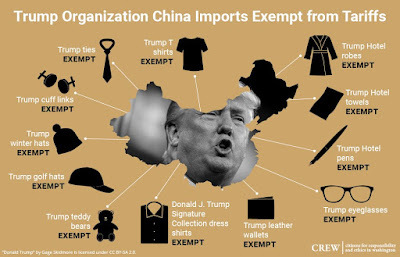 Although it was the US that persuaded China to join the World Trade Organisation and abide by the rules made by the US, perhaps they are at a point where they do need to shift on some points as they are no longer an ingenue economy. Indeed, China is already moving on intellectual property issues and gradually opening up its markets to foreign investment. We thought everyone had seen sense in May when the meetings between Steve Mnuchin and China’s Liu He produced an agreement. 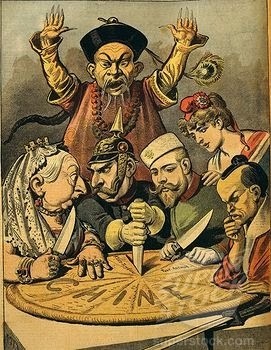 However, under the influence of arch China hawks John Bolton and Peter Navarro (a vicious wingnut on China despite no expertise who is overreaching badly), Trump capriciously changed his mind and now we may be staring something much worse in the face if he doesn’t get his “utter capitulation”. In order to bring China to heel, Trump would have to break the European Union first. That affects Britain, too. Once we’re out of the EU, it’s unlikely that Trump will allow Britain to trade with China, as per the new clause in the rejigged NAFTA deal between the US, Canada and Mexico. What was that about Brexit "taking back control"? So we’d be totally dependent on an irrational, brutish regime, eating their chlorinated chicken and Monsanto death seed produce. Wilbur Ross has already advised US business to take full advantage of a vulnerable post-Brexit Britain, calling our hour of need "a God-given opportunity". Right now, it looks like America has given itself a heavenly mandate to go stomping the world's economies into dust because it is unable and unwilling to sort out its own problems of underinvestment, changing demographics and basic flaws in the ageing capitalism that served it so well in the past. 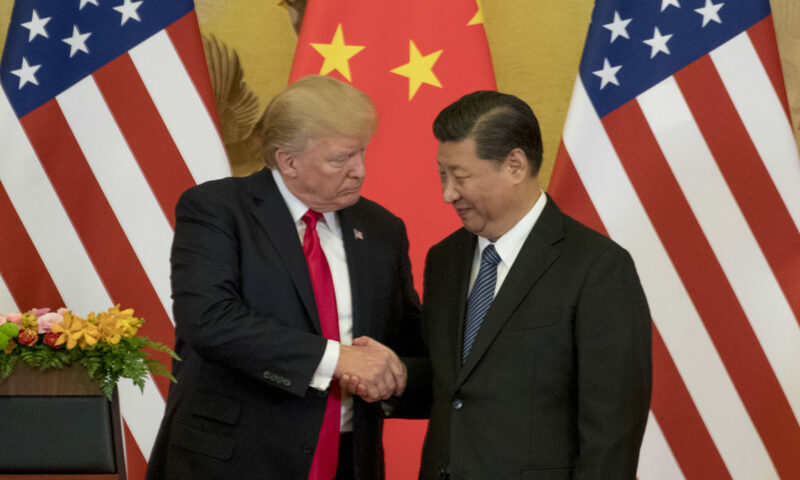 'In 2005, when the US government was pressing China to allow the renminbi to appreciate, Phillip Swagel, a former member of president George W. Bush’s Council of Economic Advisers, wrote: “If China’s currency is undervalued by 27 per cent, as some have claimed, US consumers have been getting a 27 per cent discount on everything made in China, while the Chinese have been paying 27 per cent too much for Treasury bonds.”' Donald Trump misread the US-China trade relationship.